Last year’s DNN Summit took a new shape and form. It didn’t take many post-conference-surveys to understand the changes were well received and appreciated by the DNN Community. The DNN Association continues the quest to serve the greater DNN Community and beyond by pushing for greatness and growing this awesome event, which is why we are excited to announce DNN Summit 2018! 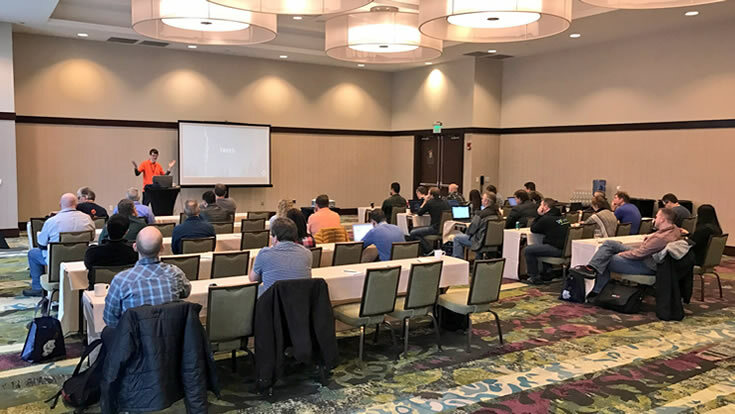 DNN Summit 2018 will return to the same venue, Embassy Suites Downtown Denver, on February 6th – 10th, 2018 so mark your calendars! Were you sharp enough to catch that? That’s right, we’ve added an extra day to the conference! From the feedback, the board heard loud and clear the community wanted more content, more time to connect, and more DNN goodness… and, well, we’re giving it to you! An Additional Day of Sessions! We’re adding another full day of session breakouts so now there will be 2 full days of sessions and we are even attempting to secure 2 keynote speakers. All of this equals twice as much great content and more opportunities to learn from industry leaders. Attendees will have a thorough list of subjects & content to consume at the conference. This should make it easier to convince your boss the trip is well worth the investment and time away from the office! The DNN Association hopes to bring in a broad range of speakers covering various topics and subjects. They are even offering $200 compensation for speakers with the hopes of attracting influential leaders and subject matter experts. Yes, we will still have pre-conference training, DNN On The Slopes, DNN Yetis, receptions, prizes, Ignite sessions and all the goodness you’ve come to expect from a DNN Conference (plus a few more surprises). Will we have a DNN Yeti anthem remix... that remains to be seen. Look for updates in future blogs! Feedback from last year’s surveys indicated attendees felt the conference was an excellent value. As you would imagine, adding an entire day and stepping things up affects the cost to put on the conference. With that said, pricing for the 2018 DNN Summit is still an excellent value. Be sure to purchase your conference and training passes before January 4th to avoid price increases. Note: We are still confirming pricing on the DNN On The Slopes portion of the event and will update when confirmed. Pricing will be similar to last year and adding this to your registration will be simple. Sticking with the notion of taking the conference to the next level, we’re implementing some new tools to make things more efficient and simple. We’re going to use EventBrite for registrations which will streamline the registration process and remove a lot of complexities for both attendees and conference hosts. We’re also using PaperCall for our call for speakers. PaperCall centralizes communication to speakers, simplifies speaker selection, allow speakers to have profiles, and gives DNN Summit exposure a large audience of speakers. And since we're talking about speakers... the DNN Summit 2018 Call for Speakers is already open! That’s right, we’re wasting no time this year with getting things rolling. Our call for speakers is now live and you can go ahead and submit your sessions. The call for speakers closes on August 15th, 2017. We hope to open conference registration around August 1st. Be sure to stay tuned to find out the exact date registration opens and when you can book your mountain lodge. Don’t stress out too much because we’ll be providing all that information in the near future… stay tuned and spread the word! Also, if you haven’t followed @DNNSummit on Twitter be sure to follow for the latest updates as soon as they are released.